Blushh sets heartbreak ablaze on their debut EP. The end of Blushh's debut EP trails off with the seemingly uncertain declaration of "Nevermind I'll be fine / Nevermind what I felt for you..." This is a mask we've all worn before – one that might convince the object of our unrequited affection that we're A-OK when it's actually the complete opposite. Blushh builds their first album upon this emotional foundation, but instead of crumbling under the weight of heartbreak or defeat, they come out more solid than ever. Blushh is the new-ish project of Los Angeles-based artist Shab Ferdowsi, who worked in booking and promoting shows before making the frightening leap to creating her own music. Her first attempt at songwriting began in earnest when she spent a three-month stint in Ireland and decided to test out busking as a way to make money. Fast forward a year and thousands of miles back to the West Coast, Ferdowsi shared her first single "Are We Too Far?" with the rest of the world. Her band name could allude to her once music-induced shyness, a feeling that's most certainly been left in the past. 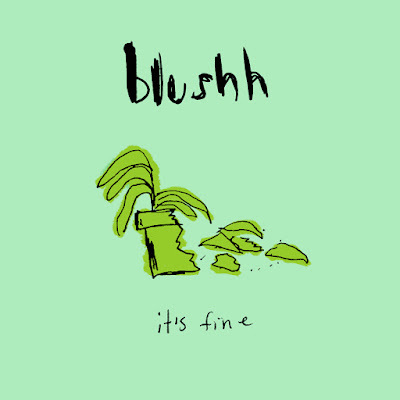 When listening to It's Fine, it's shocking to remember that the Blushh discography is only six-tracks long. Songs like "Wake Me Up" and "Not Yours" are radio-ready anthems for the brokenhearted, topped off with guitar solos and fierce backing drums that conceal the inner conflict at hand. It's the sonic equivalent to smashing your exes things, to setting your despair over another on defiant fire. Ferdowsi notes that she began writing It's Fine in her bedroom when she was overcome with loneliness. After listening to the album all the way through, it's clear that Blushh exorcised the darkness that haunted her with unbelievable results. You can stream It's Fine in its entirety below before its official release date on June 12th. "It's Fine is my first EP. All the songs started in my bedroom with lonely, wallowing feelings, as an attempt to feel fine. As it goes though, when you say you're fine, you're normally not. But you know, somehow through the process of starting my band, recording these songs, playing shows, and doing it all with my friends, I'm not wallowing lonely in my bedroom anymore. I'm feeling much, much more fine than I did before this all started." Listen to Blushh on soundcloud.